In any business, your brand is your reputation. It dictates how clients find you, how people feel about you and influences their confidence in using your services. That’s why when it comes to choosing the right franchise opportunity, selecting a reputable, recognized brand is the best way to lay a strong foundation for your success. Poolwerx strives to deliver a brand that’s at the top of its game, setting the standard for our entire industry and leading the pack in the delivery of first-class aftermarket pool care and maintenance. As a brand, we constantly evolve to ensure we are on the cutting edge of brand recognition and association, utilizing a wide range of marketing and promotional tools to present Poolwerx in the best light possible. Our Franchise Partners are our brand advocates. They live and breathe our brand at every turn. In fact, they are our brand – because without their hard work and dedication to providing superior levels of service, the Poolwerx brand would not be where it is today. 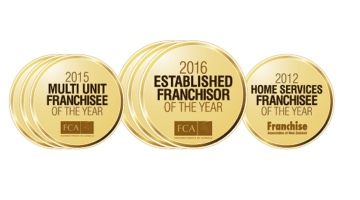 We invite you to join our strong, vibrant, service-driven brand as one of our Franchise Partners. Choosing to align yourself or your business with the Poolwerx brand is a big step. A well-developed brand helps to offer your clients a sense of trust and stability. With ongoing marketing support and regular local, regional and national marketing campaigns conducted both online and offline, we deliver new clients to your door. Poolwerx focuses on being “Number 1 in Unaided Brand Awareness,” with a focus on credibility, value, positioning and ensuring that our brand messaging reaches its target demographic: Pool owners. Poolwerx support is more than just brand recognition and marketing. Your success is our success, so we provide extensive support with HR, finance, ongoing training and more.